It’s getting to that point where I need to figure out how much more I can tackle project-wise before I have to stop crafting and start packing. This weekend we took a family trip to the quilt shop to find all the fabrics for Oscar’s new duvet cover. I’d love to get it done before we move but tackling a big scale project like that in this chaos is daunting. But then tackling the chaos is even more so. Maybe tiny projects like wee pincushions are a better idea. 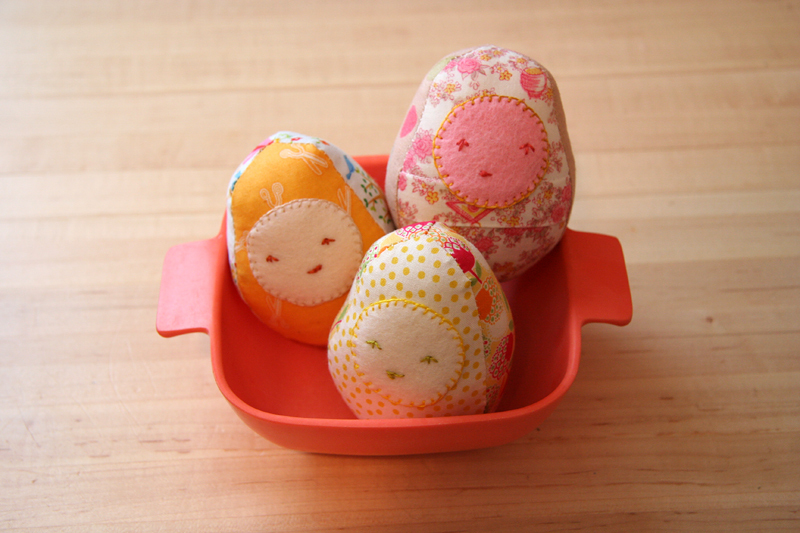 To you bunny pattern orderers – thank you so much!! They’re all on their way. Can’t wait to see the bunnies you guys come up with! If you make one before I get the flickr group set up send it to me and I’ll post it here if you’d like. I’d love to have this place jumping with bunnies. Much cuter than boxes of boxes and rolls of packing tape which is about all I’m going to have to show for myself soon. oh fabric shopping, how much fun! So sweet… what happy colors. Way too pretty to stick pins into! I can’t wait for my pattern book to arrive! My fingers are itching to finally squeeze my own big footed bunny! Thanks so much for rushing them out before Easter. I’m looking forward to making a big footed bunny for Easter. Good luck on the packing – I’ve done it way too many times. All I can say is hang in there. Speaking as a person who is in the middle of a move, CRAFT UNTIL THE LAST POSSIBLE MOMENT. Your studio is perfect right now; in the new house it will take months to get it to “feel right” for what you do. Plus, once you’re in the new house, you’ll feel like you shouldn’t be crafting, you should be painting/stripping wallpaper/refinishing floors/playing with your child/unpacking/etc. I’m stuck in a hotel for the next two months while we find and settle on a house in our new state, and I brought enough craft projects to last oh, about a year. I cried when I had to leave the sewing machine home so I had room to bring the computer, so it’s nothing but hand projects for awhile. Here’s hoping you can strike a happy medium between packPackPACK! and sewing. I got my booklets today, and they’re fantastic, as expected. Thanks so much for sharing. I have some fabric at home that I’d love to make a bunny from, I just hope that it’ll be enough – these buns seem to take quite a bit! We got our bunny pattern today (! ), though I only now got to look at the inside. As soon as I opened it my 19-month-old’s eyes expanded about four sizes and she started shouting, “HOLD, MAMA, HOLD!!!!! !” She grabbed the pattern book and ran away. I couldn’t get it back until naptime! 🙂 Can’t wait to get started…Thanks! My son just checked the mail and guess what was in there! My new bunny booklet! It’s just the sweetest thing and thanks for the extra goody! I guess I’ll be hopping on over to my favorite quilt shop to pick out that perfect fabric! Thanks a bunch! My Bunny and Robot books arrived today! What a great mail day – I’ll probably start on it today – thanks for the fast shipping and the extra goody! What a great pattern. Thanks for the super-fast shipping! It is probably the nicest made pattern I’ve ever bought (and I have tons!). Thanks again. I really have to hurry up and order one, i suppose i’ll have to ask my Mom first, (yes, im one of younger viewers out there) hopefully i’ll have ordered one by the end of this week. My book came in the mail today. I can’t wait to start the bunny. What a good way to start the week!! I just got the book. I am so excited; I am beyond myself. I went ahead this weekend and bought some spring looking fabric. There are such a good spirit. When I think about the bunny rabbit, even I haven’t started yet, I makes me happy. oh what darling pin cushions. have not been crafting….away for some time in brazil. when back in usa, will do it again. look forward to everyone’s pics on your flickr. Oh yay! I am so looking forward to the bunny book. I’m hoping to make one for my nephew for Easter. And I LOVE the wee pincushions – sweet as ever. Good luck with the quilting and the packing – sometimes you need a project like the quilt/duvet cover to totally get your mind off of the chaos of moving. We celebrate Spring at our house, so I have an even shorter time line. I am really looking forward to making this big footed bunny for the Spring basket. She(and if I’m really ambitious, HE) will be a big hit with my stuffed animal loving girl. Thank you so much for the quick shipping on the bunny book (and the postcard inside)! I hope to start cutting out some bunnies tonight. First, I have a probably very silly question: how does one sew on the button eyes after the head has already been stuffed? Is there a trick to it? I can never manage it well. Thanks again and in advance! Those eggs are really lovely. Waouh ! I love yours eggs so much !!! I received by bunny pattern book today – thanks Hillary, it’s gorgeous!